The line snaked around the charcoal Hugo Boss mannequins, extended past the neatly-arranged display of striped Lacoste polo shirts and tucked between the Calvin Klein and Michael Kors autumn apparel collections. 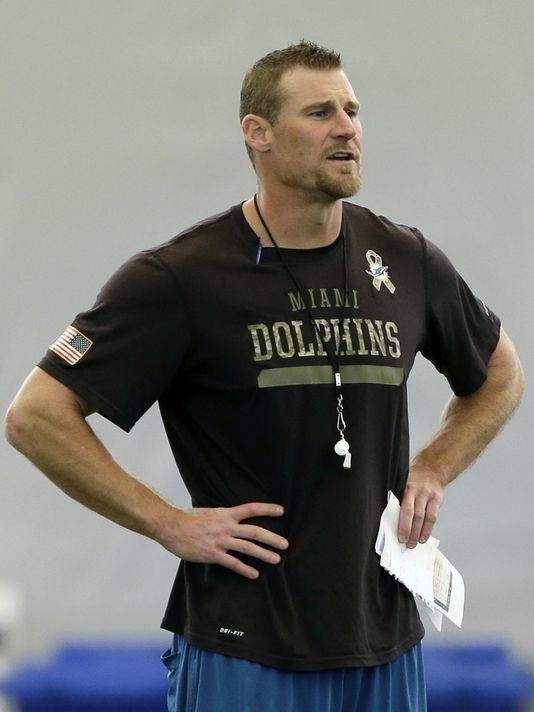 As cardboard posters bearing Dan Marino’s likeness and career accomplishments padded a makeshift stage on the second floor of Macy’s in the Dadeland Mall, one night before Halloween, hundreds of shoppers dressed in their favorite Miami Dolphins throwbacks and dug out beloved No. 13 memorabilia in hopes of snagging a priceless memory with the greatest player in team history. Nearly an hour before the meet-and-greet was scheduled to start, a DJ began blasting remixed versions of familiar ‘Jock Jams’ through the department store speakers – Montell Jordan’s “This Is How We Do It” was a particular crowd-pleaser – while a fellow employee in an eggplant suit jacket tried to hype anxious fans by rattling off Marino’s impressive highlights. None of the excitement appeared to faze our 20-month-old toddler, Charlie, who – with his bedtime on the horizon – began acting like a cranky, restless 20-month-old toddler, sprinting in the opposite direction, intentionally grounding crackers and spiking cubes of cheese in protest rather than celebration. Considering we’d already waited in one line to make a qualifying purchase, followed by another to secure a color-coded wristband that corresponded with our place in the autograph queue, it was hard to blame him. Luckily, with most Macy’s clerks focused on instructing customers and curious onlookers, an unmanned cash register served as a welcome distraction, as Charlie pushed buttons, giggled at the cacophonous beeps and error messages, and quickly discovered how to print blank paper receipts. 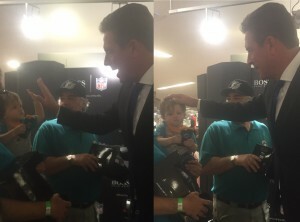 Although Marino arrived a half-hour late, to his credit, the Hall of Famer – decked in a slim-fitting black suit and matching tie – made sure to shake each fan’s hand and personalize autographs, listening intently to variations of similar anecdotes he’d undoubtedly heard for decades. 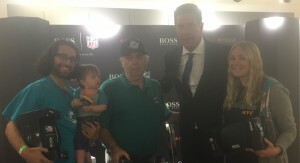 Charlie could barely keep his head up and eyes open by the time it was our turn to meet his our Dolphins hero, gazing silently as an event staffer handed us a trio of black, Hugo Boss embossed footballs and borrowed my iPhone to snap nearly two dozen photos. 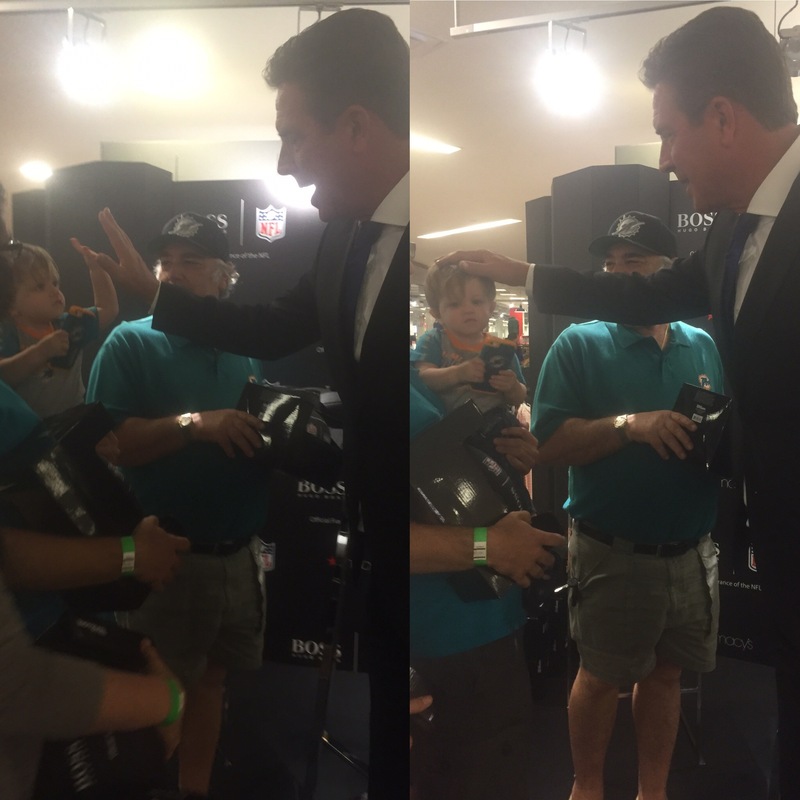 After we shared a few kind words with the former NFL MVP – informing him of DolfansNYC’s growth and proud commitment to charitable endeavors – a smiling, nodding Marino high-fived Charlie and gently patted him on the head, penning ‘Go Deep’ above his signature with a silver sharpie. Charlie may be too young to realize the significance of that moment, but one day, he’ll understand not only the meaning of the inscription, but the sentimental value of joining his parents and grandfather in a snapshot of three generations of Dolphins fans alongside their football idol. And Dan, when that time comes, he’ll be sure to take you up on your offer. 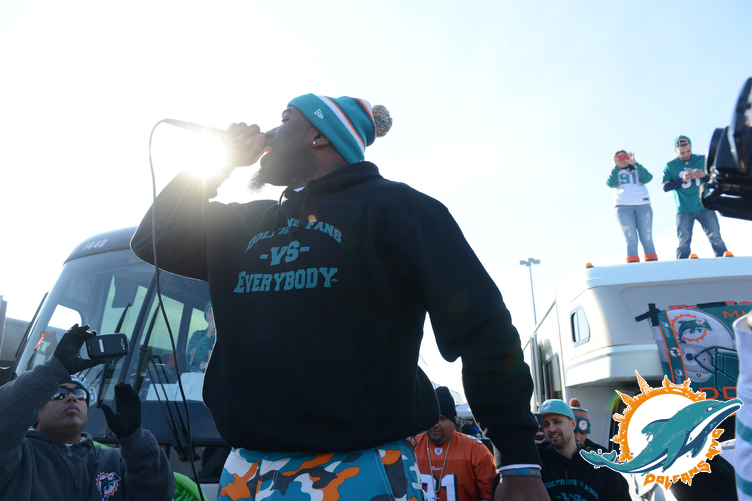 Posted in Events, Misc Posts | Comments Off on The New Dolfans NYC Anthem! It finally happened. Today we sold our 1,000th ticket to the Dolphins game in NJ on Monday Night Football. It’s a huge milestone for us because we thought we would have a hard time selling tickets since it was on a work night and Thanksgiving weekend but we have sold over 250 more than our record breaking 752 tickets last year! We now own the two highest group ticket purchases in MetLife Stadium history. We have taken the #MetLifeTakeover to another level and thank you guys so much for joining us! If you still need tickets we are completely sold out, but it’s time to announce the sections so any last minute ticket holders can pick them up on StubHub. We have nearly the entire sections of 345 and 346 so good luck getting tickets in those sections… but we also have 8 full rows in 344 and several rows in 347 as well. I recommend buying tickets in rows 17-20 in 347 and the top rows (24-26) in 344. Also there are a few seats in the “prime” section of 346 so you can get some pretty great seats cheap with a ton of Dolphins fans sitting right behind you. Let’s keep going! Now the fun stuff! Tailgate info and the big pre party! Speaking of surprises, we are throwing a big party at Slattery’s on Sunday the 30th! On Sunday at noon we are having a big party since we aren’t doing a proper tailgate. 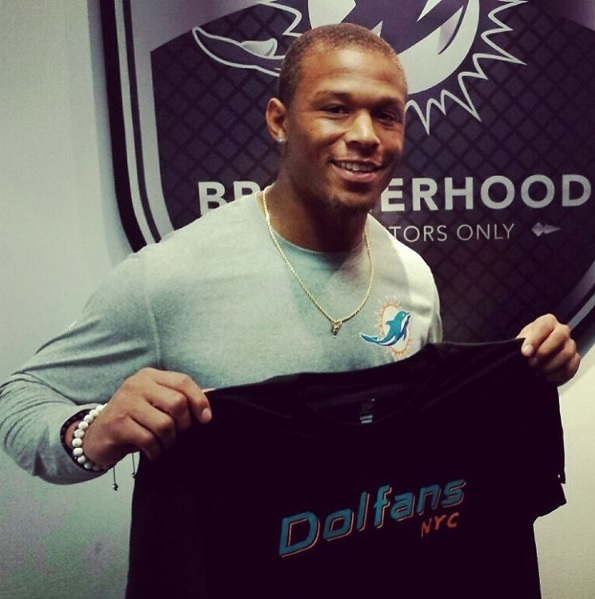 The big news is that members of the Miami Dolphins organization will be there! They haven’t told us who yet, but they are bringing a Dolphins alumni member and a ton of SERIOUS raffle prizes. This will be BY FAR our biggest raffle ever. Plus the first 150 people through the door will receive aqua Miami Dolphins t-shirts! We will be showing the 2013 #MetLifeTakeover game as well as some of the 1pm games plus we will have a performance from the one and only Solo D! There will be the same food/drink specials we have every game day at Slattery’s and there will be even more surprises. 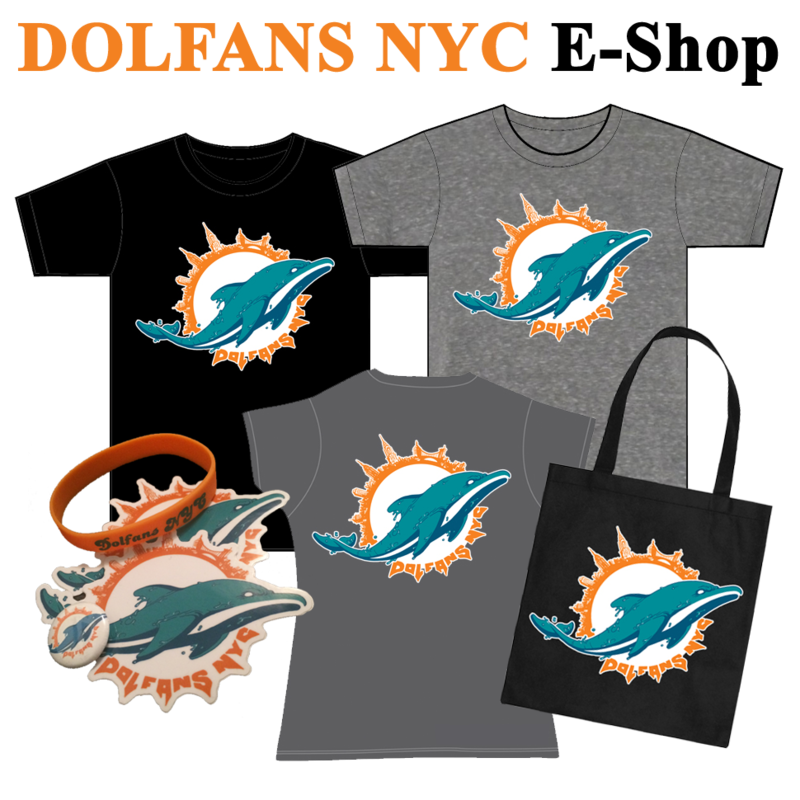 We will also be selling our new merch designed specifically for the #MetLifeTakeover we have new warm weather Dolfans NYC beanies and Dolfans NYC clear bags. If you haven’t been to a game recently the NFL now requires everyone to have clear bags if you want to bring anything into the stadium. So now you can rep our crew in style. If you can’t make the party they are now available in our web store too! Lastly we will be giving out rally towels for people going to the game with us. You must have purchased tickets from us to get one. We only have 600 so this is the only way you are guaranteed to get one. We will also be giving out wristbands for the bus and even a few inflatable palm trees! It’s going to be a party! So, let’s get excited for the best #MetLifeTakeover ever! Despite the loss to the Bills last week that smashed all hope of a successful season right out of my brain, they keep playing football games. Losing the game was bad but losing Moreno for an extended period of time was worse and the way the oline played was icing on the cake of the terrible day. After beating the Pats with our o-line playing great and Moreno destroying things I had dreams that this team was better than average. Well the Bills put an end to that. Now of course it’s only one game and this team is certainly capable of winning a bunch more this season, but it took me until Thursday to move past Sunday and if we beat the Chiefs on Sunday everything will be wonderful again. That’s just how sports work. So, this post is pretty much just a post for posts sake. It’s a reminder that the game is at 4:25pm on Sunday and we will be rocking Slattery’s Midtown Pub as always. It’s a reminder to get your money in for the #MetLifeTakeover. It’s a reminder that you should buy stuff from our web store and it’s a reminder that this club has done a great job raising money for charity and our next big fundraiser is a week from Sunday when the Phins play the Raiders in London. Save your money because it’s gonna be a great event. 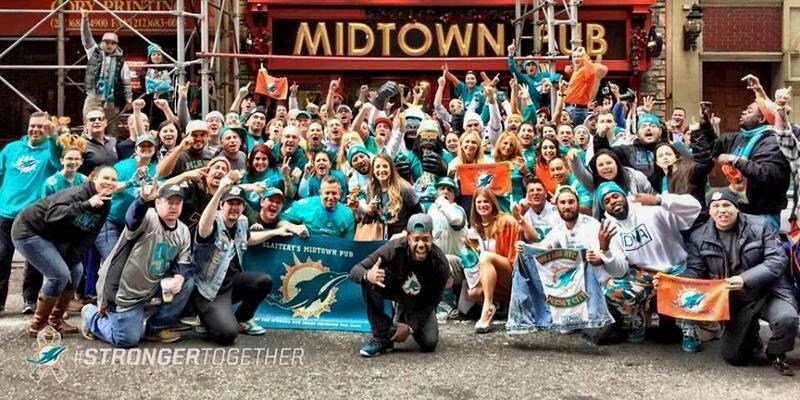 Oh, and if you are in Miami this weekend remember to wear aqua for the “Aqua Out” and make some damn noise!